Minister for Superannuation Bill Shorten made a number of public comments that are highly offensive and reek of political opportunism in an attack against the Trio Capital SMSF victims. In a politicking stunt that would rate as the most despicable political act in the history of Australia, he discriminated between two groups of investors that did exactly the same investment. Bill Shorten chose to favor the ALP’s union industry superannuation funds and establish collateral damage done to SMSFs. His politicking managed to boost the failing industry funds while at the same time generating fear about self managed funds. Trio Capital is referred to as a "collapse". The Parliamentary Joint Committee used the word "collapse" in their inquiry, "Investigation into the collapse of Trio Capital". The word "collapse" is used on Bill Shorten's web site. The word "collapse" suggests that the fund imploded, failed, disintegrated, and or crumpled. Debunk Myth 1 Trio Capital did not collapse. It did as it was designed to do, siphon retirement savings out of Australia. It did this successfully right under ASIC and APRA's regulatory oversights. 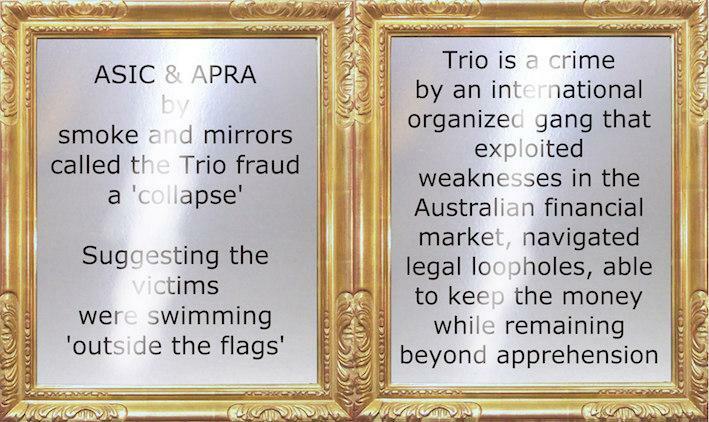 ASIC has not made it publicly clear about what happened in the Astarra / Trio fraud and this has enabled the often misrepresentation that the loss of money was attributed to the Trio Capital collapse. The official story in the press and in the government Hansard shows Trio Capital being lumped with Banksia, MF Global and Storm, referring to them all as the funds that collapsed. Debunk Myth 2 Trio Capital has nothing in common with Banksia, MF Global and Storm. To lump together such funds is about as enlightening as collecting the cadavers of murdered victims, suicide victims and death by old age for a road safety seat-belt campaign.